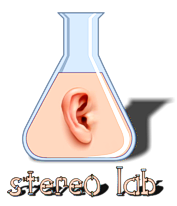 Stereo Lab is a stand-alone application. At present only available for the Apple platform. The UI is very simple and includes help callouts wherever explanation is required. The following files types are supported: WAV, .AIFF, .AIFF-C. and FLAC. To process files, simply drag uncompressed audio files onto the interface and have them converted according to the process selected in the stereo enhancement and post process windows, or in the Settings dialogue. The software includes the capacity to convert whole CDs by simply dragging the disc contents to the interface so that entire music collections may be processed swiftly and efficiently. It is possible to audition any converted file directly from the application by right clicking on the file as it appears in the main window. This is invaluable when comparing different conversions; for example of different phonograph equalisations.